A game with a unique set of controls. The player uses a replica of a hand cart, which is a simple mode of transportation used on railway tracks back. 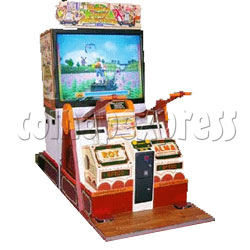 The way it is used is the player must move the control lever up and down, this is causing the cart to accelerate. As with a real life hand cart. It can be used by 2 players one on each side. The objective of the game is the hero Roy, needs to recover the sacred stone stolen by the evil Mommy and his henchman Marrow. The player needs to catch the enemy's cart by the end of the stage to win. The track is not always straight and without perils. The player also has foot pedal, he needs to be pressed when the cart needs to jump over danger. In the two player mode, both players need to press the pedal simultaneously. If the player succeeds in catch the villan by the end of the stage. The stone is reclaimed. The game then continues at a different location and this time the player needs to keep ahead of the villan to keep the stone safe. The player also has a life bar that if depleted causes the game to be over.